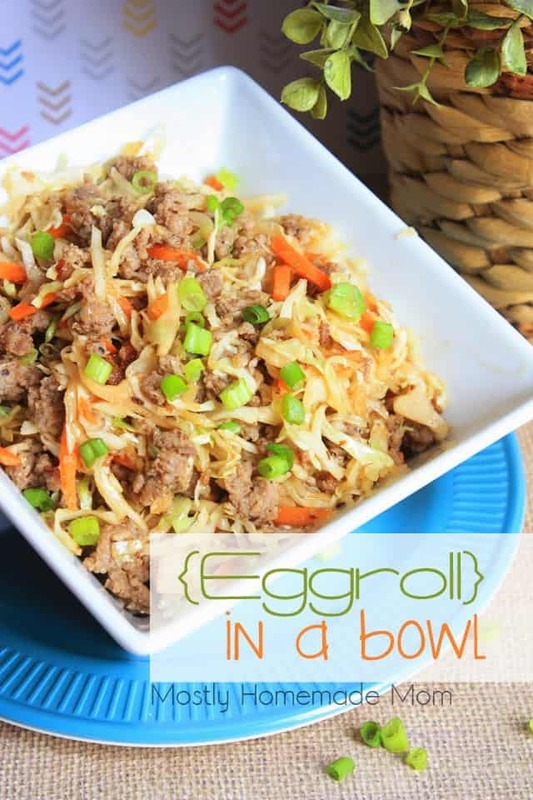 If you’re looking for a low carb way to enjoy your favorite Chinese takeout egg rolls, you absolutely NEED to try this meal! You can substitute ground turkey for the sausage, or even mini shrimp as some commenters below have tried. Serve it over a bed of greens for a nice salad the next day at lunch, too. I’m loving all the ideas you all are coming up with – leave yours in the comment section below as well! 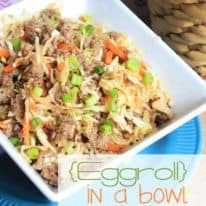 This dinner recipe features ground pork, cole slaw mix, and seasonings to create a low carb egg roll served in bowls. Easy, simple, healthy – my kind of dinner! I know Lindsay, I do love the fried wrapper too! I'll splurge when we get takeout, haha. Oh, it is! Thanks so much Catherine! I always love eating the filling when my family makes eggrolls! Love this idea! This looks so yummy! I love eggrolls, but not the fact that they're fried. Especially when I'm trying to eat healthy. Thanks for sharing! What kind of ginger did you use? Ground, fresh? Thanks! Dont forget you can use turkey sausage and cut back on even more calories fat and salt!!!! I use it all the time!!!! Will try this!!! Sounds so yummy. Just made this for dinner with turkey sausage and no ginger (found out once i got home i didnt have it… boo) served with brown rice and it was pretty tasty. Even the semi picky hubbs liked it 🙂 thanks! Ginger is not listed in the ingredients. Sounds yummy though and will be making tonight! It’s in the recipe now, so sorry about that Ana! We LOVE this recipe! Making it today! YUMMY. I’ve made this twice and both my husband and I really like it! I like the low-carb factor but there’s still plenty of flavor to satisfy the tastebuds! We think it’s rather ‘filling’ too! One question tho ~ ginger is not listed in the ingredient list but in the recipe it is. Do you use ginger root or powdered ginger and how much? Thank you! 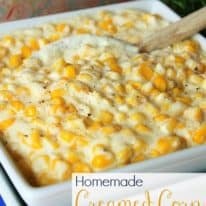 Wonderful and easy recipe!! It’s going into my “go to” file. I did add slightly crushed ramen noodles (dry) and instead of soy sauce, I used a small portion of the ramen powder and water instead. Note…add ramen powder to taste in 1/4 c water first. Do not sprinkle powder packet directly. This is nasty….too much soy sauce. Made per directions and now my whole tounge tastes like nothing but salt, 1/2 cup soy sauce is too much! Don’t make this!! SO GOOD! I exchanged beef for the sausage and added a little more soy sauce. So easy, quick, and tasty. Made this with ground turkey instead of sausage and it was FANTASTIC!!! It was delicious BUT even using low sodium soya sauce we found it too salty. The next time I make this I will use half the amount of soya and substitute water for the other half. If not for the saltiness I’d rate it 5 stars. Read the reviews, so cut way back on soy sauce. I used ground pork, and added about 1 teaspoon of oyster sauce. It was salty, but not overpowering. It was delicious. I will definitely make this again. I love how quick and easy this is ! Tastes great. Thanks for sharing this. Your comment is gross. You can simply modify the recipe to fit your taste. Hi! I want to try this recipe, but I’m wondering what the serving size is? It says 395 calories per serving. How much is one serving? Thanks! I changed it up a bit by using broccoli slaw and 1/4 cup of soy sauce with a splash of sesame oil. Next time I’ll add a bag of carrots/peas! So easy and yummy! I make this now with ground chicken, a couple of shrimp, and add broccoli slaw as well as extra carrots. It adds extra fiber to the mix 🙂 It’s a very healthy recipe! Thanks! Made this and my son loves it.. I made this recipe tonight and it is so good! Easy to make, budget friendly, and filling. I did accidentally grab broccoli slaw, but it still taste delicious. OMG….THIS WAS SO GOOD. I ADD A LITTLE OF MY FAVORITE SEASON (ACCENT) AND IT WAS THE BOMB. MY CHILDREN LOVES IT, WE EVEN TOAST SOME TACO SHELL AND MADE SOME TACOS. THANKS FOR THIS EASY AND TASTY RECIPE. WE WILL SURELY ADD THIS TO OUR DINNER LIST. Absolutely delicious, and so easy to make.. I read the comments first and anticipated saltiness. Only substitute I made was using liquid aminos in lieu of soy sauce. I misread label thinking it was LESS sodium than reduced sodium soy sauce. Unfortunately, per serving was a tsp compared to a Tbsp. So.. very salty. Otherwise, very good. Next time I will compensate by using less amino/soy and increasing with another liquid. I also might try broccoli slaw someone mentioned. Will try again. Pretty tasty! Just will use less soy sauce and throw in an egg as well. I used about 2TBSP of ginger paste instead of crushed ginger, and I served over Bashmati rice. My children LOVED it!!! Great recipe. Thank you. Easy on the budget and very tasty. Added a bit of honey to tone down the salty soy taste. Added cilantro at the end. Is the egg roll in a bowl nutrition facts based on serving size? 1/4 of what’s made? I’m not an adventurous cook, but decided to try this because I’m low carb at the moment. So good and easy! The only thing I added was a dash of sesame oil. Thanks for creating! 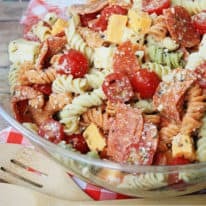 This is a fast an easy recipe with a great end result! Used ground turkey instead of sausage to sell the wife on it. Thanks for the Pin! Used liquid aminos and reduced to 1/3 c. Way too salty. I have added at least a cup of water to cut the saltiness. I would maybe rinse the sausage or just use plain ground turkey next time. I love to make cabbage dishes like this so I will try to find a solution to the salt. How much is a “bag” for this recipe? I love this recipe. I’ve used ground chicken or turkey to make it Weight Watchers friendly. I make it on Sunday, divide it up in containers, and take it for lunch all week. Very satisfying! One of my family’s new favorites! So fast and easy to make, with so much flavor…I substitute coconut aminos for the soy, and no one knows the difference. DELICIOUS!!! I’m not a fan of sausage (unless it’s in gravy) however I am a fan of egg rolls – fried dipped in sweet n sour sauce! I still decided to make this as I am going low carb. I LOVE IT! It’s soooo easy to make. I’m usually not a fan of “substitute” type recipes, but this one is great. I think it will be my new go-to meal. The only thing I will do differently next time is reduce the amount of soy sauce just a bit – but everything is spot on. Thank you for posting this, Kelly! Didn’t have sausage but I did have ground beef. I added my own seasoning for the beef but then followed recipe. Excellent. Love LOVE this! It was delicious and so easy! 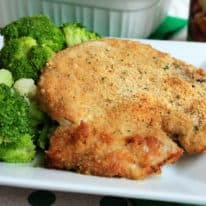 I’m definitely adding it to my list of keepers in my Keto friendly recipes. I used ground pork…so easy! I would add that I never use low sodium soy sauce, but I do think this recipe needs it. I used regular soy sauce and my dish was a bit salty. Can’t wait to try this recipe. I am wondering though, before you put the bag of slaw in with the cooked sausage do you drain the pan? I’m a baker not a cook and so I am slightly challenged in this department hahahaha! Mine was WAY too salty…. my family couldn’t eat it. So I added zoodles to absorb some of the salt, added juice from one lime and fried 3 eggs just to put in half the dish and only then were we able to eat it. And, yes, my soy sauce is lower sodium. But with the adjustments we all loved it and will make (the edited version) again. Thanks! This was really good. I used turkey (because I had it) and liquid aminos instead of soy sauce. I added a little sriracha and it was awesome. Great addition to my keto diet! I made this tonight. This is incredibly salty even when using reduced sodium soy sauce and half of what the recipe called for. Total waste of ingredients. We threw it out. Not a single person in our home would eat a second bite. We even combined it with rice to try to cut the salt a bit. What size bag for the coleslaw mix? So fast, so good! This recipe is a keeper, especially for busy nights. This was easy and delicious! I thought I had all of the ingredients but when I went to make it I didn’t have the soy sauce. It was good even without the soy sauce. The first time I made this, it was a tad salty to our liking. This time I used ground turkey, added a little sage, used ginger paste and 1/3 cup of soy sauce and it was perfect! 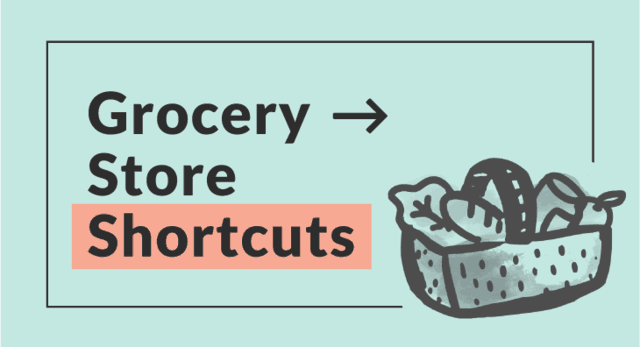 Super easy and really fast. Very tasty! Definitely need to cut the soy- even with reduced sodium version. Otherwise, yummy and easy! This recipe is fantastic! Is the nutritional value at the bottom for all 4 servings, or for one serving? Add a few crunchy wonton strips on top ! Great, easy recipe. I halved the soy sauce as my husband has trouble when he has too much of it. I also didn’t have ground ginger but I had fresh. 1/2 tsp ground ginger is equivalent to 2 T fresh minced ginger. I used only about half of that as well because I was concerned it would be too spicy for my kids. We loved it with these slight changes. It ended up too spicy for one my kids anyway so I will further decrease the amount of ginger I put in next time. My other son said it was “heaven on a plate.” I’ll definitely make this again! Thank you! I love this recipe! When I’m pressed for time or lost for what to make for dinner I can count on this as a winner meal. I do tweek this however by adding some Ramen noodles cooked without the season packet. I have boys and it makes a more heartier meal and I also add some veggie such as sugar snap peas or asparagus etc. Very good I will definitely make this again! Are you suppose to drain the meat after it’s cooked before adding the cole slaw mix or is the grease part of the flavoring? 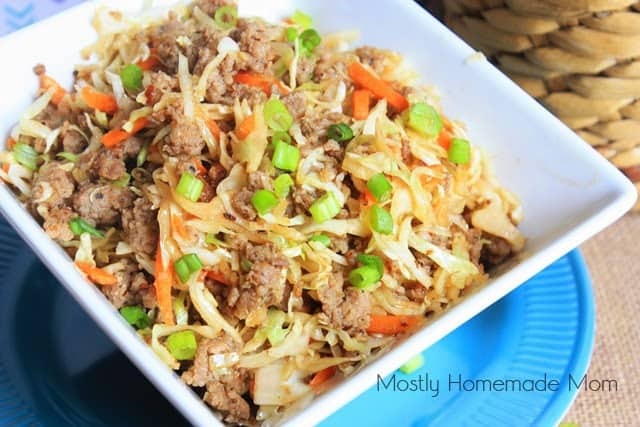 I used ground pork and the cole slaw mix. After reading about the possible saltiness I decided to do my own spices. I used salt, pepper, garlic, and Lowery’s Season Salt. This was perfect! I also added 2 eggs. This was soooo good! Thank you for the idea! 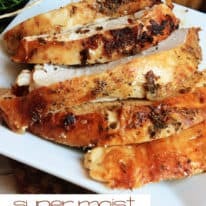 My favorite go to low carb, sugar free recipe. I could eat it everyday! Quick and easy too. Could probably go with 1/4 or 1/3 cup of soy sauce, low sodium. Otherwise it was a hit with the family! Absolutely will make this a new favorite!! I made this with ground turkey. Added 1 tsp sesame oil just because everything tastes better with sesame oil. Perfect for a ww member and a type 2 diabetic!!! This was crazy good! I added my own flare to the original recipe. I added teriyaki sauce, cilantro and a wedge of lime to kick it up just a bit. And I used wonton strips like a previous reviewer mentioned for the added crunch. Def in my cooking rotation! I added a tiny bit of honey to mine. Looked just like the picture and was so easy. Tastes sooo good. Definitely a keeper. 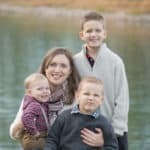 MY HUSBAND JUST FOUND OUT HE IS DIABETIC, SRVING IMPORTANT. HOW MANY SERVING ARE IN THIS RECIPE. IT LOOKS SOGOOD! Tweaked this for an even healthier version. Substituted ground turkey for the sausage and also used coconut amino liquids instead of soy sauce. The whole family loved it. Could definitely cut back on the liquid next time! So yummy! I followed the recipe and added water chestnuts and chow mein noodles for some crunch. Do you use just plain sausage or something flavored (like jimmy dean)? Very good!!!! I would reduce the soy sauce. It was way too salty. I found this recipe to be super good. I suggest starting with 1/4 cup of soy sauce add more if you need it. I found a half a cup made it way too salty for my liking. To fix that I rinsed 3/4 of the slaw off. Perfect meal for my bariatric surgery that was two months ago. Why are there so many carbs? 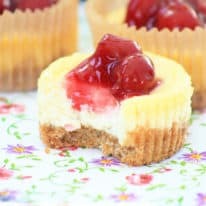 Such a delicious recipe!! I switched out the ground pork for ground turkey since my sleeve does well with turkey. This is perfect for post-op VSG patients. It makes appx. 8 bariatric friendly servings. 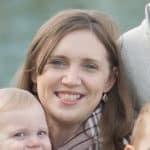 I shared a post on my blog and linked it back here! Thank you for sharing such a tasty dish!! 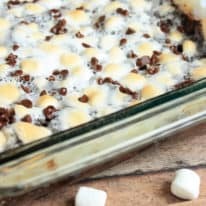 My family loved this and so easy to make!! Is this supposed to be plain ground pork or a flavored sausage?